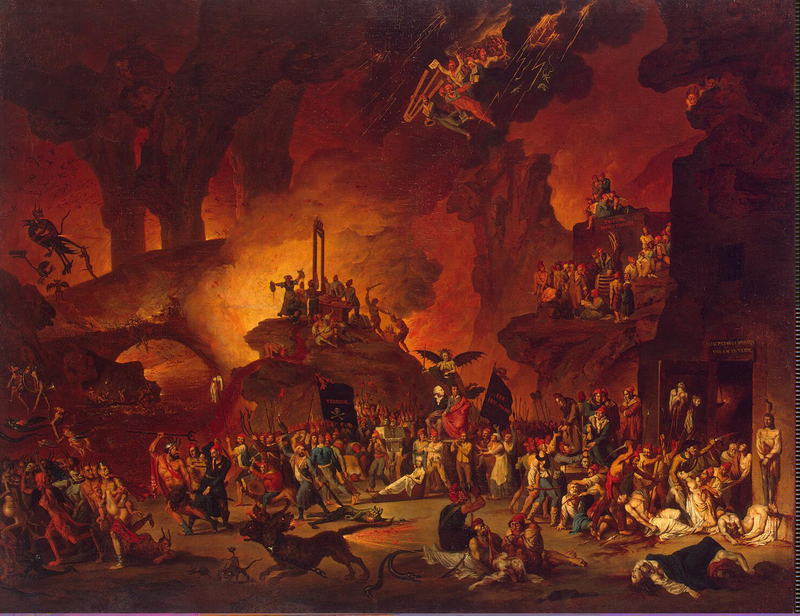 The collective memory of the Terror was described by Michelet as "a huge Dantesque poem, which circle by circle, caused the descent of France into Hell". This extraordinary painting entitled The Triumph of the Guillotine captures the vision perfectly: Revolutionary iconography meets Hieronymus Bosch in an apocalyptic landscape of all-enveloping red. The picture, which is now in the Hermitage, is usually attributed to the landscape painter Nicolas-Antoine Taunay (1755-1830). In the painting's imagery, the real personages, institutions and policies of the Terror are transferred with effect to the infernal regions. A mountain surmounted by a guillotine provides the central focal point like some infernal Calvary. At the top of the canvas a group of artists and Jacobin poets, led by David with his painter's palette and easel, fly in amidst smoke and lightning bolts. On the right at mid-height sits the Revolutionary Tribunal, implacable as ever. Across the bottom progresses a Revolutionary procession: Robespierre and Saint-Just are carried in triumph, preceded by Marat in his bath. Scenes of killing and cannibalism occupy the foreground. Even the demons of Hell themselves are afraid and flee, abandoning their flaming abyss to the Revolutionary invaders. The attribution to Taunay rests only on stylistic analysis, but is accepted in the major monograph by Claudine Lebrun, Nicolas-Antoine Taunay (1755-1830) (2003), p.44.